Minister of Industry and Commerce Rishad Bathiudeen represented Sri Lanka at the Pangkor International Development Dialogue (PIDD), “Davos of Asia” in Ipoh, Malaysia yesterday. Among the more than 1000 participants this year is 2006 Nobel Prize winner, the Grameen Bank founder Professor Muhammad Yunus. 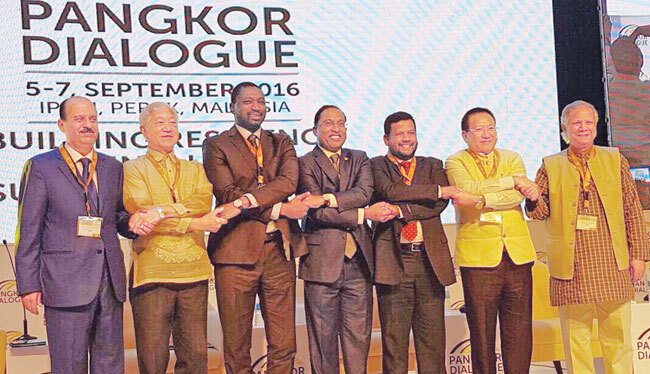 Minister Bathiudeen, showcased Sri Lanka to the event participants and said that the Pangkor event comes at a time when Sri Lanka enters a period of major economic and social reforms under a unity government. The outcome of the dialogue provides actionable and impactful recommendations for the benefits of all stakeholders.